The next generation in commercial grade CAE design, analysis and optimisation for mechanical transmissions is now available. Below summarizes the major updates in the latest release of MASTA. For further details get in touch. New results available including airborne sound power for a full FE component. Interface improvements to allow more flexibility in the results shown, including showing the response at multiple locations on one plot. 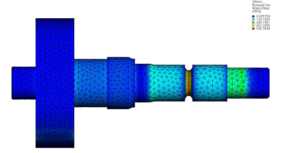 Export of operating deflection shapes in op2 file format that can directly be used in acoustic analysis packages. Display of operating deflection shapes in 3D view. 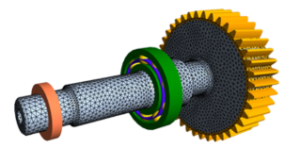 A new option to generate FE meshes of shafts and gear blanks directly in MASTA with full control over the mesh parameters and including all rotationally symmetric features such as fillets and u-shaped grooves. The latest SKF bearing catalogue contains data supplied by SKF that was previously not available and therefore estimated by MASTA. Full release notes are available on request or from the SMT Portal. © 2002-2019 Smart Manufacturing Technology Ltd. Registered in England and Wales. Registration no. 4570982.